Price: $4? I want to say? Like basically everyone, ever, I love chocolate! I also happen to really love Chai. Earlier in the summer I discovered Chai flavored chocolate bars at several other grocery stores and bought a few different varieties to try them out. I was mostly disappointed with them, except for one from Belgium that turned out to be pretty good, but at $5-8 for a tiny bar, I just couldn't keep buying them. So I was pretty excited when I discovered this at Trader Joe's. Unlike a regular chocolate bar, this one is clearly meant to be consumed over several sittings. 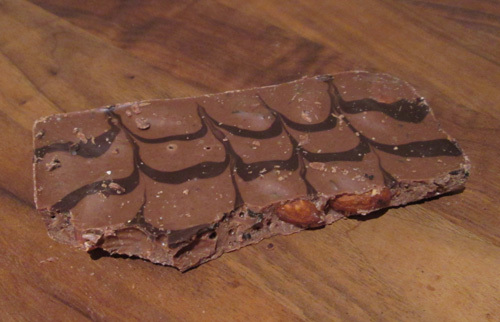 It's not only larger in size, but also in thickness, and is actually more like a chocolate bark than a candy bar. 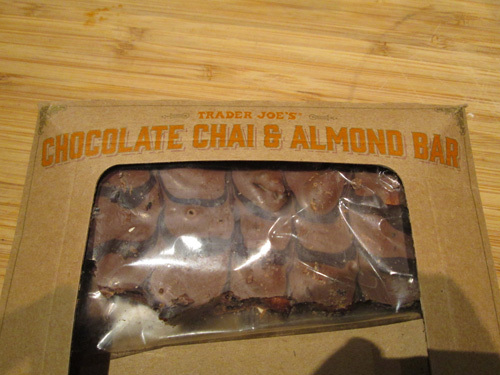 The chocolate and chai balance each other out nicely, with a good blend of sweetness and a bit of spiciness. The almonds are good, but I think I'd have actually liked it a bit more without in this case. 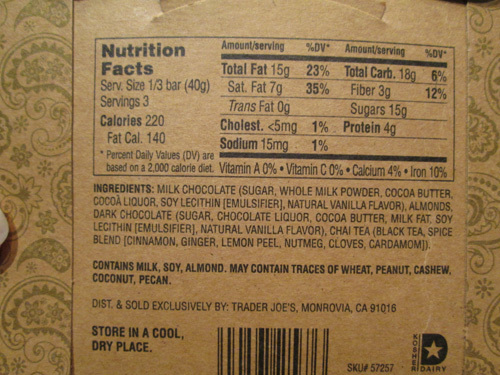 Although they do add to the quality of the texture, especially since the bar is so thick. I'll definitely buy this again, as evidenced by the fact that this first one is almost gone already! If you're not a big fan of chai, though, this probably won't be a great choice for you since the flavor is strong enough to be noticeable.